Update 09/10/12 – The webinar is over, but they have made it available for viewing free here. Wether you are a beginner, a backyard hobbyist, a homesteader, or a skilled professional wanting to grow more food sustainably and for less work, Aquaponics has something to offer. 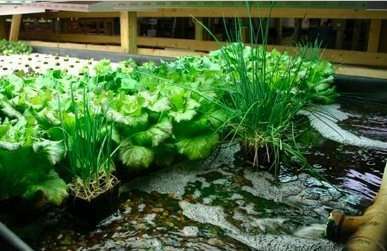 Aquaponics is one of the most sustainable and productive farming systems in the world. It combines Aquaculture and Hydroponics to create a truly self-sufficient closed loop system that uses only a fraction of the water, labor, energy, etc. that other methods use, while producing up to 10 times as much food! Join Max and others in this powerful farming method for this FREE webinar to learn more about this amazing approach to food generation, green business and sustainable design. This hour- plus long webinar is an introduction and sneak peak into the Upcoming 4-day Training: Closed-Loop Aquaponics With Applied Permaculture Design, happening in Santa Rosa, CA in Sept.
« Live Burning Man Web Cam feeds – See What You are Missing! This entry was posted on Monday, September 3rd, 2012 at 11:21 AM	and is filed under Hydroponics / Aquaponics. Both comments and pings are currently closed.